Glutamine is a conditionally essential amino acid and endogenous production of glutamine is usually sufficient to meet physiologic needs except during times of metabolic stress.1,2 Oral glutamine supplementation can replenish deficient levels or augment levels for therapeutic purposes. The dosing of glutamine varies widely among clinical trials and in practice. This article highlights some of the dosing options for glutamine and the function and risks of different dosage protocols. 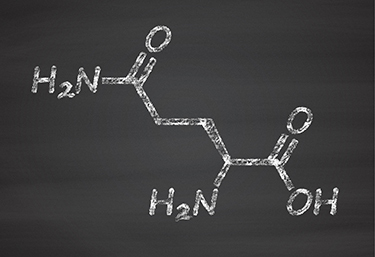 The demand for glutamine increases when the body is under physical or even emotional stress. The excess cortisol associated with stress leads to production of cytokines, increased oxidative stress, and a higher demand for glutathione—effectively draining endogenous glutamine supply. Endurance exercise that extends longer than 2 hours decreases serum glutamine levels and potentially damages lymphocytes, which rely on glutamine for energy.8 Glutamine may be in higher demand for any person with compromised intestinal barrier function. * Finally, individuals eating a low-protein or vegan diet may have an increased need for glutamine supplementation. The most typical dosages used in clinical practice range from 5 to 30 grams per day. There is some concern that long-term dosing of glutamine may lead to increased serum ammonia, as this was observed in a pediatric study at a dosage of 750 mg/kg (51 grams for a 150-lb person).14 Concerns have also been raised about the potential for glutamine to enter neurons and convert to glutamate via glutaminase. This would suggest that caution should be used in individuals with conditions related to the neurological system. There is a dearth of evidence suggesting that oral glutamine is neurotoxic, and it is important to note that accumulation of glutamine outside of the nervous system is not a safety issue. What remains is either a theoretical concern or unpublished anecdotal experience. Kim H. Yonsei Med J. 2011;52(6):892-7. Sacks GS. Nutr Clin Pract. 2011;26(1):44-7. Souba WW. Annu Rev Nutr. 1991;11285-308.
dos Santos R, Viana ML, Generoso SV, et al. JPEN J Parenter Enteral Nutr. 2010;34(4):408-13. Peng Z, Ban K, Sen A, et al. Shock. 2012;38(1):57-62. Wessner B, Strasser EM, Spittler A, Roth E. Clin Nutr. 2003;22(6):515-22. Gleeson M. J Nutr. 2008;138(10):2045S-9S. Cury-Boaventura MF, Levada-Pires AC, Folador A, et al. Eur J Appl Physiol. 2008;103(3):289-94. Boza JJ, Dangin M, Moënnoz D, et al. Am J Physiol Gastrointest Liver Physiol. 2001;281(1):G267-74. Khogali SE, Pringle SD, Weryk BV, Rennie MJ. Nutrition. 2002;18(2):123-6. Benjamin J, Makharia G, Ahuja V, et al. Dig Dis Sci. 2012;57(4):1000-12. Sufit A, Weitzel LB, Hamiel C, et al. JPEN J Parenter Enteral Nutr. 2012;36(5):556-61. Khogali SE, Pringle SD, Weryk BV, Rennie MJ. . Nutrition. 2002;18(2):123-6. Ward E, Picton S, Reid U, et al. Eur J Clin Nutr. 2003;57(1):31-6. Borges Dock-Nascimento D, Aguilar-Nascimento JE, Caporossi C, et al. Nutr Hosp. 2011;26(1):86-90. Garlick PJ. J Nutr. 2001;131(9 Suppl):2556S-61S. Shao A, Hathcock JN. Regul Toxicol Pharmacol. 2008;50(3):376-99.